Having a blog is a great thing as you can share anythings you like. Blogging is growing day by day and most of the internet users have a dream to create a blog, led by the idea of Make Money Blogging. But dream is one thing while executing is another. There are many blogging platforms are available on internet which allow you to create blog without any cost while some of them are paid. If you’r newbies in Blogging and thinking to start new blog, I recommend to go with Blogger.com. Almost every new blogger starts blogging from Blogger.com and after gaining experience and skill you can then also move to WordPress or stay with Blogger. 4 Post your First Article on your Blogspot Blog? Blogger is the Google product and one of the Well-known blog publishing service. It was created by Pyra Labs, which was bought by Google in 2003. These are hosted by Google at sub-domain of Blogspot.com. Since it is Google product, so it’s trustworthy, highly secured and more reliable. Blogger is full free blogging platform where anyone can create blog without having knowledge of programming language. Blogger is free to use and you need not to pay single INR or $$$. On Blogger, you’ll get free sub-domain in YourBlog.blogspot.com form. It’s trustworthy, highly secured and more reliable. As I mentioned in above lines that Blogger is Google product so, you need to have a Google account(Gmail) in order to Create your first Blog on Blogger. 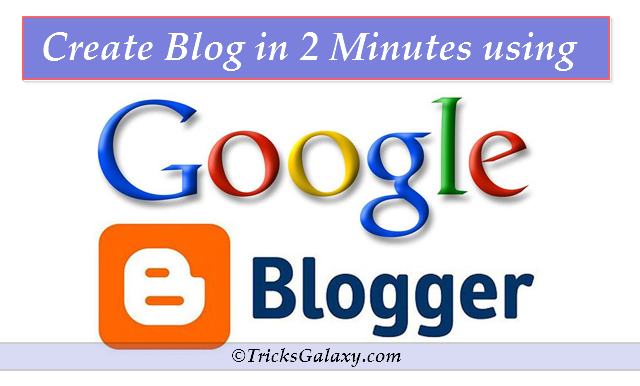 Go to Blogger.com and Sign in with your Google account. In next page, select Create a limited Blogger Profile. In Display Name field, type Your Name which you want to see/display in your Blogger Profile and make a click on Continue to Blogger. Well done! Your Bloger account/dashboard is ready, it’s time to create your First Blog. First click on New Blog. 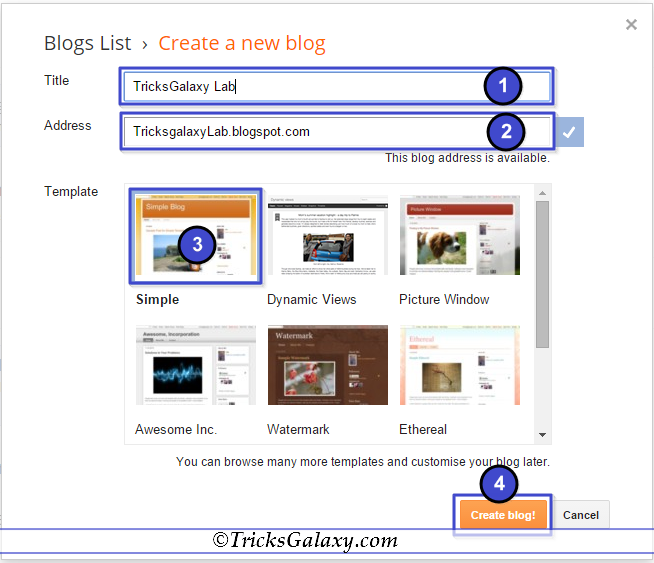 Now enter your blog Title and URL/Address for your blog and select any Template. If you have entered wrong Title and URL then no need to worry, Blogger allow you to change Title and address of your blog. Also you can update your blog’s template whenever you want. Your blog is ready, time to post article. Post your First Article on your Blogspot Blog? Select your blog to open blog dashboard. Once you blog’s dashboard is opened, click on New post to post your first article. Title is the heart of the Article/content, So enter the proper Title and type your article. Don’t forget to use extra awesome features of Blogger i.e. Lable, Permalink, Search Description etc. Blogging is one of the best place to introduce yourself in the worldwide internet. Creating blog is very easy. One of my favorite is creating blog on own domain and hosting via WordPress. Starter can go with Blogger.com. If you like the post don’t forget to share it on Facebook and Twitter and do subscribe to our newsletter to keep receiving updates. Don’t forget to Share your views about Blogger Platform. Please, give your feedback by commenting below in the comment box.